The products and brands of Eco-Terr Distributing Inc. Please note: for your convenience, you may download the VersiGrid™ Example LEED™ Credit Scorecard Calculator in Excel Format. 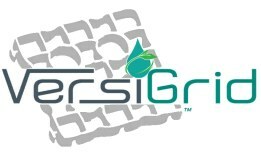 used for: to project how your goal of a LEED™-certified construction/built environment project will benefit from the correct utitlization and application of VersiGrid™, and by incorporting its usage into your design or site plan from the initial project conception/design phases. and so forth (please note: this may require that a skilled, experienced, correctly educated LEED-AP™ be retained and contracted for your LEED™ certification project). IF: your project - before incorporating VersiGrid into your design - is able to attain only a LEED™ score of 14 LEED™ Credit Points = "not certified,"
THEN: the additional LEED points derived from the full utilization of VersiGrid™ into your project may elevate your project to the LEED™-PLATINUM certification level. PLEASE NOTE: even a partial and/or minimal application and utilization of VersiGrid may elevate a project from "not certifed" to LEED-Silver or LEED-Gold certification levels. This is entirely dependent upon the professional skills - and the vision and the understanding of environmental sciences technology - on the part of your architect, designer, or design/build firm. Reusability = portable and reusable, no permanent structure. Wildlife habitat protection = designated path for reduced wildlife disturbance. Using VersiGrid above significant riprap/drain rock- essentially "doubling up" the advantages of preventing and/or reducing SWR during normal rainfall events; while providing an "underground storage" for runoff from adjacent buildings. This category suggests that a story be presented to integrate all of the innovative applications and uses of ECO-TERR products and the resulting impact upon the project design and building use. Example: REDUCED FUTURE MAINTENANCE, REPAIR and/or REPLACEMENT in areas subject to winter freeze/thaw cycles and groundsurges, due to ECO-TERR grids' porosity + flexibility, they are insusceptibe to the damage resulting from groundsurges that damage/deconstruct conventional forms of pavement . . .